In the tradition of Wilhelm von Humboldt, Reiseuni_lab experiments with new models for teaching and research by design through diverse cooperations with universities and art schools throughout Europe. Across the continent, this experimental architectural laboratory focuses on the sustainable transformation of existing built structures in urban contexts. The diversity of European schools of architecture and building culture has been developed into a post-graduate Master's Programme and the European Architecture Dialogue, accompanied by an interdisciplinary reflection on design strategies, by workshops and conferences. In the following, we present the results of these activities, which began in 2008, as an open-access online publication in four volumes. Still greater diversity is therefore needed in professional practice and, as a consequence, in architectural education and training. The basic goal of education is to develop the architect as a "generalist". Since autumn 2013, we support the development of the innovative International Master's Programme of European Architecture together with the research network Reiseuni_lab. As five years ago, we opened the integrated Master's Programme of Architecture at our Faculty of Civil Engineering again after four decades and in the tradition of Tallinn Technical University, the rector of this time, Prof. Dr. Keevalik, the Dean Prof. Dr. Liias and me decided to support the initiative of Prof. Irina Raud, who was the driving force to re-establish the architecture and to invite the founder of the Reiseuni, Prof. Dr. Dagmar Jäger, as guest professor for anchoring the international project in Estonia. We are convinced, that the pioneer project has been strengthening the renewal and connectivity of education and research in architecture within the European landscape after Bologna since its inception some 8 years ago. It represents part of the internationalization strategy of the TTÜ and its research agenda within the Estonian policies of networking all over the globe and towards Europe. The new Master's Programme has been starting in autumn 2015 with our double degree partner of Universidade Autónoma de Lisboa and the cooperation partners – universities in Ljubljana, Innsbruck, Berlin and Haifa, including the Bauhaus Dessau and Aalto Academy. The opportunity to support this "European Architecture Dialogue" with our institutional framework enriches the Estonian diversity of architectural research from within the university to facilitate the knowledge transfer between those involved throughout wider Europe. The declaration of the UIA, pointing out that "the increasing mobility of architects between different countries calls for mutual recognition or validation of individual degrees, diplomas, certificates and other evidence of formal qualification" need time and over all, especially cooperation practice on multiple layers. The new Master's Programme of European Architecture enable a small, but growing community of professors, local experts, students and alumni to contribute to this European horizon of knowledge growth and cultural exchange in thinking and living. "The humane task of architecture is not to beautify or to humanize the world of everyday facts, but to open up a view into the second dimension of our consciousness, the reality of images, memories, and dreams." It is with great pleasure that I am writing this message for the digital implementation of the Reiseuni Report – European Architecture Dialogue. I am familiar with the project, since it was established at the BTU Brandenburg University of Technology, Faculty of Architecture, Civil Engineering and Urban Planning from 2010 until 2013. Since then, it has unfolded further, based on the experience of these four years, and now I have received the opportunity to read the report. It reflects a very special and fascinating journey full of information, insights, challenges, and stimulation, in which you never get lost because of the uniquely organized structure. Architecture is an interdisciplinary field that integrates arts, social and cultural sciences, technology, and economics. Although we can observe a strong tendency toward specialization, the architect as generalist is still needed, with an ability to analyze the task critically, moderate the design process including its contradictions, take the responsibility for decisions, and integrate the different aspects into a sustainable project. The work on project-oriented design studios, developed in the architectural faculties of most European countries since the seventies of the last century. The programme offers much more than any course that I know – eight workshops and three design reflections in different cities and universities give the students the unique possibility of studying urban and architectural topics in contexts with varying methods, conditions and challenges. Individual work and diverse constellations of teamwork in an advantageous rotation are coherent parts of the education to train communication and reflection skills, and different design strategies. Research as an inherent activity of architectural teaching is one of the most innovative parts of the programme. The eight workshops investigating different and site-specific topics of European cities are focused on actual urban transformation processes. The design reflection workshops play a key role and serve to elaborate the different design processes. The colloquium and the final master's thesis conference contribute to the development of research topics. The published Reiseuni Report provides deep insight into different aspects of the European architectural dialogue and a wealth of information about the study programme – the unique interdisciplinary and international curriculum, the variety of teaching methods, and the learning outcome of the students. This report is the first comprehensive look at the integration of learning, teaching and research in the field of architectural design. It is an invitation to interested people from all over the world to discover more about the significance of architecture as a clue to broader culture. How is it possible that a thing appears real, he is asking, even if its synthesis is never fully accomplished? How can I experience the world as an actually existing individual when none of the perspectives under which I try to comprehend them is able to be exhausted and when the horizons remain always open? Architects always face complex problems. In a variety of European cities, today's professionals have to deal with the re-thinking of existing structures, while carefully transforming built architecture and heritage with respect to cultural traditions and social needs of the urban population. They develop multifaceted strategies to deal with today's urban and environmental challenges in collective design processes, including the experimentation with (temporary) re-use or hybrid (re-)programming within built fabric. While conquering future horizons of the urban life in open societies, architectural typologies and sustainable concepts should be based on a holistic understanding of human and social living conditions with open-minded consideration of democratic practices and respect to climate change. Heuristic, reflective design concepts and transparent communication strategies, for example process-oriented dialogues involving citizens, experts and local leaders, require interdisciplinary approaches. Overall, the tremendous transformations taking place in European cities requires individuals who are able to tackle these changes in variable formats of cooperation, they need to act as team-generalists. After decades of specialization and equalization of the academic landscape, architectural education and research in Europe demands a move towards a different kind of professional responsibility which reflects a democratic society's needs. In other words, our pluralist and interdisciplinary tradition of the research-integrated and project-based architectural design education in the reforming mind of Wilhelm von Humboldt has to be re-organized and re-focused. But this appeal to reform raises both challenges and chances. How do we accumulate architectural knowledge and generate site-specific solutions in a glocal (global and local) mind-set, together with students, professors and external experts? Instead of disregarding differences, how might we profit from the rich and diverse university landscape of Europe? How could a European platform for research and advanced education be imagined as multi-perspective and open thought space? And: How can the university's free space of interdisciplinary research be linked to real-life problems of citizens, cities and their representatives – with regards to institutional, political and cultural concerns? And finally, how do we define new aims for a generalist architectural research and study programme, preparing students for the wide range of international professional requirements and supporting their personal and professional growth as socially responsible individuals? These questions were the starting point that inspired the pilot project of Reiseuni in 2008, which was to be developed in cooperation with technical universities and art academies across a variety of European cities: the two-year international master's degree programme in combination with a research platform of ten universities and institutions was launched in 2010. Four important traditions have been transformed into contemporary challenges in the programme's manifest, the Reiseuni Charter: First, the tradition of the Grand Tour and the German Walz: learning abroad by design practice and research on multiple sites during temporary stays; second, the European Ideal of university: combining research and education of young people within project-oriented learning processes in moderated team work; third, the deepening of the Erasmus programme experiences towards cooperative activities within one course of study at different places; and forth and last, our discipline-specific Master builders tradition, which brought about the interdisciplinary workshop culture during the 20th century, and implemented as a core element in the post-graduate study programme. The key concept: Over the course of two years, an international student unit would realize a sequence of eleven studio-based workshops in diverse cities as traveling group and finish their studies in a six-month research period with a master's thesis, which is supervised and accompanied by a team of international professors and local experts throughout Europe. Kitchen round tables and a kick-off conference between 2008 and 2010 served as the initial base of discussion for the diversity of European research and teaching experiences with international members of the Reiseuni_lab, founded in Berlin. These gatherings were attended by peers and architect colleagues – in the beginning Inken Baller, Rainer W. Ernst, Caroline Schönemann, Rhys Martin and Chris Burns, shortly after, Maria Schneider from Innsbruck, Stéphane Hanrot and Pascale Urbain from Marseille, Mar Loren from Sevilla, Irina Raud from Tallinn and Ricardo Carvalho and Flavio Barbini from Lisbon. The two-year Master's Programme and the accompanying European Architecture Dialogue have been the two foundational modules of the Reiseuni_lab' s activities, thanks to the support of the administrating institution, the Brandenburg University of Technology at Cottbus, which initiated Architektur.Studium.Generale [A.S.G.] in a first period of Reiseuni_lab between 2009 to 2012. In a second phase, the so-called Master's Programme of European Architecture had been modified under the roof of Tallinn University of Technology as double degree with Universidade Autónoma de Lisboa in 2015, starting with two more experienced partner universities in Innsbruck and Berlin, and the new ones, Bauhaus Dessau Foundation and the Faculties of Architecture of the University of Ljubljana and NB Haifa School of Design. Since its inception, two academic cycles with altogether 36 postgraduate students of 13 different nationalities have been completed. Two classes with students from Italy, Estonia, Turkey, Germany, Portugal, Switzerland and Iran are ongoing today. Since 2010, 30 workshops took place at 14 different universities; eleven conferences and various lecture series deepened our exchange in Cottbus, Innsbruck, Kiel, Berlin, Tallinn, Tiflis, Riga and Lisbon. The great experiences throughout both project periods have been documented and reflected between 2008 to 2017 not to mention the still ongoing post-processing period of the experiment. The first volume Reiseuni • Pilotproject [Vol:I] introduces 6 Points of key qualities of education and research – transforming the existing, designing processes, acting as team generalist, research about design, Humboldt reloaded, multi-perspectival strategies – and describes the interdisciplinary think tank for the civil society from within universities' cooperation. The second chapter of volume 1 explains the main modules and structure of the Master's Programme, the European Architecture Dialogue and the international network Reiseuni_lab. In the third part of volume 1, eight alumni from Spain, Greece, Estonia, Germany and Portugal contribute with diverse reflections about the programme as a model of education and their individual experiences of being "always on the move" during the first project cycle between 2010 and 2012. These texts first have been presented in the kick-off conference of the second period at TTÜ Tallinn, the European Architecture Dialogue #5, in 2014. In three chapters, the second volume Theory • Research by Design [Vol:II] develops the qualities of architectural research by design, unfolding a multi-perspective approach towards architectural traditions of learning, schools of thinking and strategies of design research rooted in interdisciplinary experimentation from the 20th century to today. The conditions Between social utopia and real laboratory are developed in the first chapter of the volume to demonstrate the wide range of architectural research approaches. Beyond borders – group experiments and alternative strategies proceeds to discuss interdisciplinary processes of appropriation, experimenting with the common by self-initiated built and unbuilt projects and pioneering strategies with a special view to the Berlin laboratory after the fall of the wall. In the third and last chapter of volume 2, Concepts of hermeneutic strategies and artistic tracing, we approach the source of recognition, thoughtful accumulation of knowledge and interpretation, which is considered the cornerstone of the author's design theory. This volume has been developed since 2016 and will be published stepwise until 2019. The third volume Workshop Cluster • 12 Research Fields [Vol:III] introduces didactic objectives and research terms of the Master's Programme's curriculum and its workshop framework. Each of the twelve chapters explains the teaching and research activities of the ten participating universities during the period of 2010 to 2012 and represents something like a "book within the book", respectively describing one workshop cluster, based on the host city. Every chapter details the particular research strategy and site-specific goals of the local professor responsible of the workshop, including the workshop programmes and a selected presentation of results. 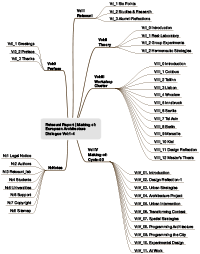 The volume states the outcomes of the first project cycle including the Master's thesis period (2010 - 2012) as well as reports on the first year of the second cycle (2011 - 2012), to illustrate the cumulative research activities and workshop sequences from the different universities and cities, characterizing and allowing to compare the individual architecture school and way of thinking. Six professors of the Reiseuni_lab network from Spain, Germany, Estonia, Austria and Portugal also contribute their reflective positions about their research goals, methodologies and interdisciplinary or intercultural experiences after the completion of the first rotation in 2013 [Intro, CBU, TLL, LIS, INN, SVQ, BER, DR, Master]. 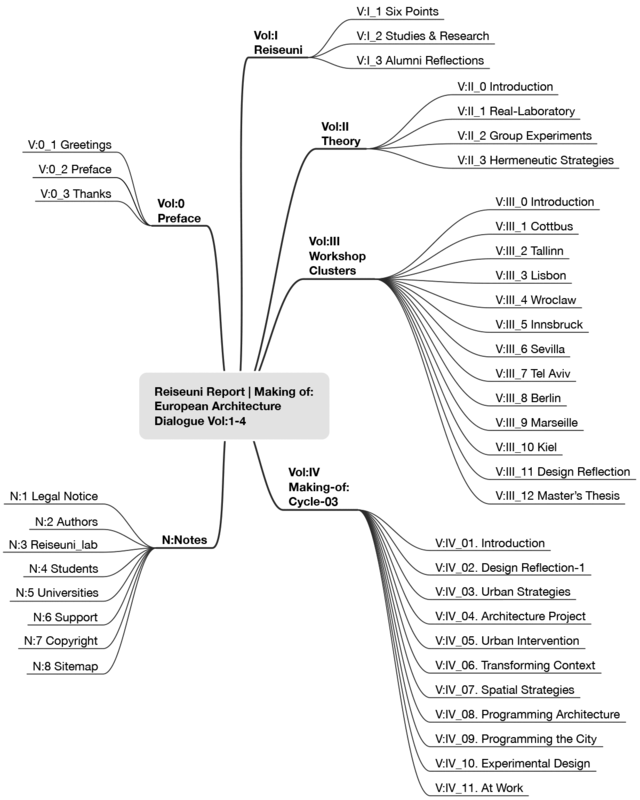 The forth volume Making Of • Cycle-03 [Vol:IV] has been developed during the 10th workshop Design Reflection 2 in December 2016 at Universidade Autónoma de Lisboa with students of class_03 (2015-2017) and illustrates the on-going workshop cycle. The publication does not document the cycle city-wise, but organized as a didactic choreography of heterogeneous tasks, scales, sites, strategies, concepts and aesthetics. The aim of the workshop was to visualize, analyze and compare the experienced design strategies, educational programmes and project results of all nine preceding workshops in a systematizing and self-reflective manner. My final recommendation for the reader is: Enjoy the voyage through the European cultures, the architectural didactic strategies and research approaches, the diverse positions. Profit from this European experiment, which shows various situations of challenges and problems, but opens a treasure of diverse spatial answers and design approaches. Whoever you are, you will find inspiration and guidance throughout these volumes – as student of architecture or as an architect, as teacher of architecture or art or urban design, as expert or interested European citizen having to deal with the production or design of architecture or urban environment. Get inspired by the intercultural dialogue and European cooperation, seeking small and local steps of knowledge and change in a context of cities and people who want to enrich the discourse about future solutions of our living and built environment. Since 2008, the Reiseuni_lab has grown into a network of professors, students, alumni, experts and supporters of institutions from currently more than 20 countries around the world. The international study programme and research dialogue with 14 involved universities and institutions has been created to cooperate and work together, it has been prepared and accompanied by round tables, curriculum development, approval procedures, conferences, letters of intent, cooperation contracts, scholarship implementations and (self-initiated) funding structures, establishing a multifaceted communication and coordination culture that engages administrative, research and teaching staff. Reiseuni_lab cooperates with local colleagues, engaged citizens and experts and has witnessed an incredible number of engaged and energetic people throughout the years of this projects. We would like to take this opportunity to thank all friends, partners, supporters and collaborators who have gone with us through the periods of this pioneer project. Until today they have shaped the thinking about concepts, projects, didactics, positions and have contributed to seeking opportunities to realize a multitude of workshops, conferences, colloquia and exhibitions, and finally, this large-scale online publication project. I would like to thank the over 40 authors of this report for their fruitful, engaged and inspiring contributions during both periods of our collaborative and multi-national experiment since 2008 – students, alumni and colleagues who share their didactics, research programmes and results, but also theoretical positions, analyses and reflections in this publication. We especially would like to thank the authors for their patience during the publication work process, from 2013 until today. Lastly, we extend our thanks to all architects, professors and guest lecturers who participated in the study programme until now, and who shared their local research input for the European project with local and discipline-specific expertise, feedback and critique. These contributors who shaped our discourses and exhibitions in universities and public spaces of the cities like Tallinn, Berlin, Innsbruck, Kiel, Sevilla, Marseille, Ljubljana, Tel Aviv, Haifa, Dessau, Wroclaw, Helsinki or Lisbon with the Reiseuni_lab and have engaged their own interdisciplinary and local teams of colleagues and experts during feedback sessions, and participated in colloquia and conferences, supporting the European Architecture Dialogue in Cottbus, Innsbruck, Kiel, Tallinn, Tiflis, Ljubljana, Riga, Lisbon and Berlin. Many ideas, cooperation projects and working relationships, private and professional partnerships, even friendships have been born and established out of this project – spanning across national borders and more than three generations, building relationships between people, universities and institutions. We would like to thank all early supporters of the Reiseuni_lab since the pioneering years of the project in Germany in 2008, and then in Estonia and Portugal to expand the institutional construction of a double degree between TTÜ Tallinn and UAL Lisbon since 2013. For the years of trust, open exchange and deep dialogue, we want to address our thanks to the main mentors of the project, Inken Baller, Rainer W. Ernst, Rhys Martin and Chris Burns, who have been involved in our concept finding and networking from the beginning. Given their open and critical feedback, their wide intellectual frameworks and experiences and their tolerant thought space, they have enriched this project with their continuous participation in our roundtables and with practical support throughout the time, keeping the generous belief that we are doing something that would succeed and could offer a new path and model of university education and architectural research in Europe. Further special thanks, we would like to address to Renate Fritz-Haendeler, Karen Eisenloffel and Carolin Schönemann, who have been supporting our initiative with feedback and support in institutionalization, and their confidence towards the future of the pioneer project since the beginning. To Friederike Landau, I want to extend my thanks for intellectual feedback concerning the author's special terminology transfer for the research about design field. To Irina Raud, I want to address my special thanks for her important contribution to the start of the project. She engaged the powerful group of Estonian students at the beginning in 2010, and in the second period, she was the driving force that initiated the renewal of the architecture education at Tallinn University of Technology. Irina has been connecting the Reiseuni_lab with the North of Europe, integrating strong personalities and architect colleagues like Esa Laaksonen from Helsinki and Emil Urbel and Katrin Paadam from Tallinn. Considering these developments, I want to say thank you to the Rector's Board of Tallinn University of Technology, Rector Andres Keevallik and Vice Rector Jacob Kübarsepp – both with a beating heart for architecture. Because of their engagement during the establishment of our second period in Tallinn, and together with their engaged administrative team who is still important since the project was housed in Tallinn, it was possible to manage the legal, administrative and funding-related matters to change the Master's Programme into double degree programme. Lastly, I would like to express great thanks to the long-term partners of the project – next to Irina and Rhys – Maria Schneider from Innsbruck and Ricardo Carvalho and Flavio Barbini from Portugal, who have been strongly supporting the first and second period of the Reiseuni not only with their exciting workshop projects, an excellent research and design profile and strong teaching position, but also with the permanent constructive support during the periods of establishments from 2009 to 2010 and since 2013. Throughout the shared and inspiring working time, the Reiseuni_lab students, alumni and colleagues have been profiting from their creative, open, challenging and critical input, the engaged workshop realizations and the intensive dialogue participation, which has connected the network with amazing new members and workshop guests like Ulla Hell from Italy, Marusa Zorec from Ljubljana, the Aires Mateus brothers Francisco and Manuel or Ines Lobo from Lisbon. With these colleagues at hand, the Reiseuni has the power to strive towards creating future horizons that develop and share solutions, knowledge, experiences, connections, projects, cooperation. Above all, we seek to contribute to develop responsible and progressive concepts that shape the social and living conditions of, with and for people all over Europe and beyond its national borders.